If you've not already done so, set up an email account on our server first using the control panel. Please see our instructions for this here. Log into your Hotmail account and click the settings cog towards the top-right of the browser window. Scroll to the bottom of the pane and click "View all outlook settings", then select "Sync email". You'll see the option to add a connected account. Click "Other email accounts" and a box will appear requesting email account information. Fill in the 'Display name' box with your personal name or the name of your company and enter your email address in the appropriate box along with your password. Most importantly, tick the box for 'Manually configure account settings'. 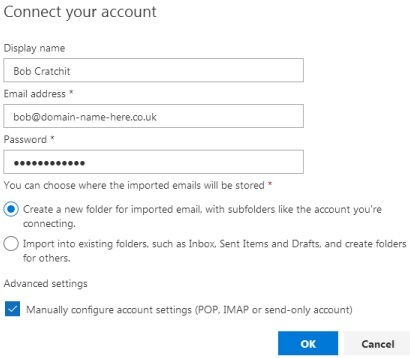 If you forget to tick this box, you will need to delete the account within Hotmail and re-create it again as the settings cannot be modified later! The information in the window will expand showing extra options when you tick the box for "Manually configure account settings". You need to enter the Mailbox account name as you've set up within cPanel® (control panel) which generally is the same as your email address. The incoming server should be set as per your setup instructions with ourselves. If your account is SSL enabled, you can alternatively use your own domain name here. The incoming server port should be entered as 110. Untick "Leave a copy of messages on the server". This will help to ensure that the email account with ourselves doesn't get full. Authentication should be set to "Basic". 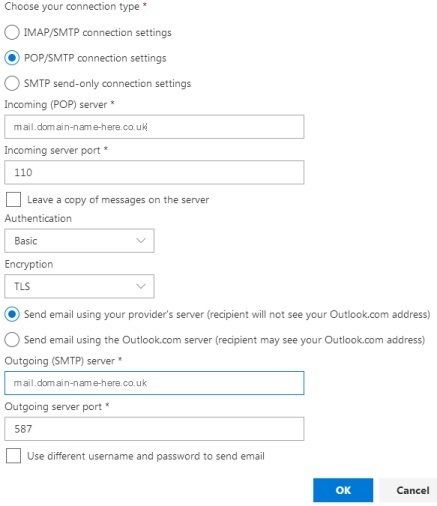 The outgoing SMTP server should be set to the same server as the incoming server entered earlier. The outgoing server port should be left as 587. Click the "OK" box at the bottom followed by "Sync email" to complete.